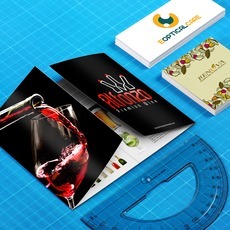 Digital printing refers to the method of printing a digital file directly to a medium using a computer. It involves no preparation of plates, cylinders, and/or water. After designing your material, you can print your artwork using a command button from your software and this signals the digital printer to start printing. Read on to further understand digital printing process, its applications, and advantages. The process of digital printing is not as complicated as that of the conventional press which involves plates, films, and/or water. In digital printing, the digital file is directly sent to the printer through a computer. The printer takes in a medium (paper) and starts printing on it. The printer starts firing jets of ink on to the surface of the substrate (paper), instead of being absorbed like in the conventional printing process, it forms a thin layer on the surface and is infused to the medium through heat process using a toner. For a better illustration, see image below. •	Shorter turnaround – There are no preparations needed for etching plates or transferring images to film. This results to a faster printing process simply by sending the data from your computer to the printer. •	More accurate counts and less waste – There are no need to balance ink and water. This may result to defective printouts since human intervention is needed to maintain consistency. •	Cheaper cost for lesser volume printing – Since there’s no need to prepare plates, printing digital is cheaper – you don’t have to pay for plate space. •	Variable data printing – if you’re using a home printer (which uses digital printing process too), you can change elements such as text, graphics, and/or images can be changed from a printed copy to the next. With the much advancement in technology, expect digital printing to become faster and more reliable in terms of print consistency at a much lesser printing cost. This is what digital printer manufacturers are currently working on – to produce a printer fast enough to match offset printing production and be able to print larger quantities using a wide array of substrates (medium). You really can’t generalize whether one printing process is better than the other whether digital or offset. The key to maximizing the value of your money in outsourcing your printing projects is to determine the need of your business. Carefully analyze the strengths and advantages of each custom printing process and from your printing needs, decide which one is more applicable to you.